Coach's Corner - John F. Kennedy & Jacuqeline Kennedy dual signed 1960 Sports Illustrated! Go Back to Lot List John F. Kennedy & Jacuqeline Kennedy dual signed 1960 Sports Illustrated! This December 26, 1960 full VG issue of Sports Illustrated shows the "First Couple Elect" on the cover, enjoying a boat ride. 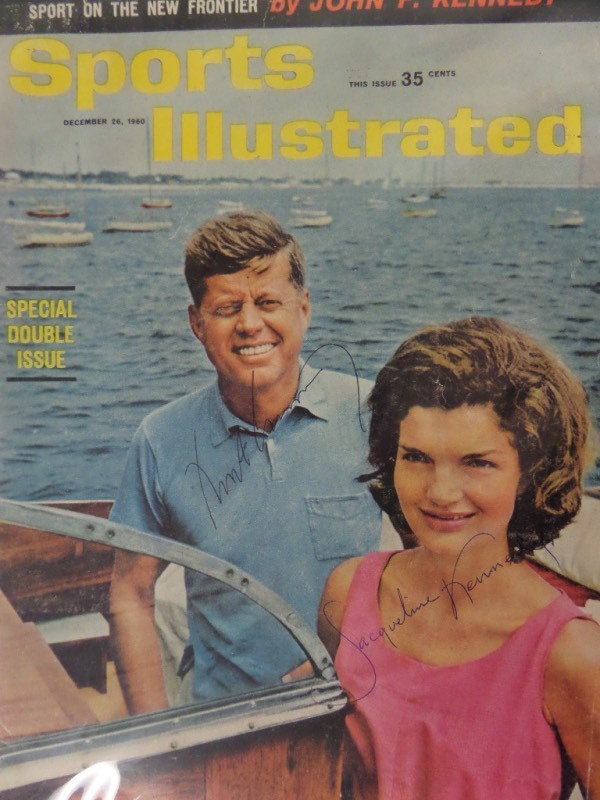 The cover comes black ink-signed by JFK, and blue ink-signed by his First Lady, Jacqueline Kennedy in black ink, with each grading a fine, legible 7. With the President tragically-slain 55 years ago, and his legendary First Lady no longer living either, this piece is valued into the low thousands!